Canada's right-leaning National Post has a great long read about Great Lakes shipping. 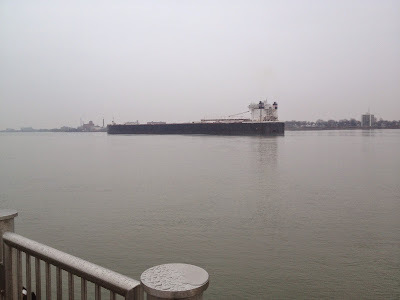 Peter Kuitenbrouwer's article tells the story of the industry's recent upswing through a diary of the week he spent aboard the MV Kaministiqua, a 730' bulk carrier as she ships Saskatchewan wheat and Manitoba soy from Thunder Bay to Sorel Quebec. It's a great account of the journey and the cast of characters aboard the Kaministiqua. From the article, it seems like the surge in St. Lawrence shipping this year has taken a lot of folks by surprise. Apparently the surge in transporting crude oil by rail has clogged a lot of the rail lines running from the Prairie Provinces to Canada's western ports. This has forced grain carriers to rely on the St. Lawrence to get their commodities to market. The whole article is worth the read. Our friend, Michigan Exposures, has tons of pictures of the Kaministiqua and other Great Lakes ships over on his website.